Peacock evolution through sexual selection: Feathers, sounds, eye-tracking, and lekking. Hey girl, heyyy. Hey, where are you going? It’s easy to scorn the peacock. To watch him as he preens, struts, and turns unabashedly to check out his own behind is to understand exactly how he earned his reputation as nature’s most noxious narcissist. Just ask Purdue University peacock researcher Jessica Yorzinski, who has seen him at his most undignified: performing his entire mating display for the wrong species. Yes, that’s right. Before Yorzinski’s eyes, the peacock has fluttered his feathers, bowed his head, and let loose his obscene squawk while charging lustily toward the object of his desire (a spectacle known as the “hoot and dash”)—only to find out that he’s attempting to mount a squirrel. How could nature have molded a creature so ornamental, so unwieldy, and with such costly accoutrements? In fact, that is the question that kept Charles Darwin awake at night. Initially the peacock’s train, showy and cumbersome, seemed to contradict his grand theory of natural selection—that animals succeed or fail based on their adaptive traits. “The sight of a feather in a peacock’s tail, whenever I gaze at it, makes me sick!” Darwin once wrote to a friend. Talk about a strong incentive to please your woman! And so Darwin, like peahens, began to recognize the use in the peacock’s uselessness. Instead of a threat to his theory, this bird became its poster child: His very unnecessariness made him the ultimate example of how selective pressures could forge dramatic changes in a species. “Often we come up with new wrinkles, but the theory (of natural selection) is so cogent in a way that we really shouldn’t be surprised that it works,” says Robert Montgomerie, an evolutionary biologist at Queen’s University. Today, researchers like Yorzinski and Montgomerie and others are building on Darwin’s insights. 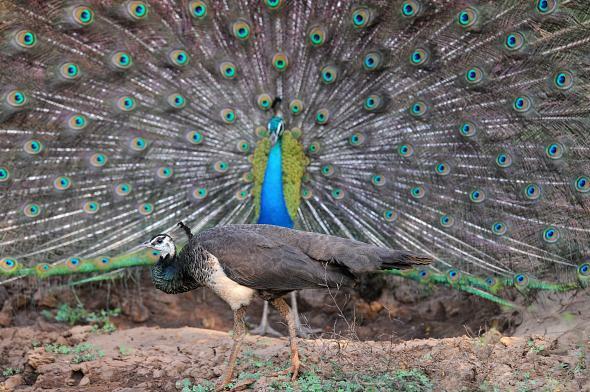 For instance, it turns out it takes more than just appearance to attract a peahen. Recent research in Animal Behaviour found that peacocks rely on sound and movement as well as their looks, making infrasonic coos that human ears can’t detect in order to attract the ladies. “The emerging picture is that the auditory itself may be far more important than the visual domain,” says Jim Hare, an animal behavioral scientist at University of Manitoba and lead researcher on the study. Hare has even seen peacocks in captivity whispering their sweet nothings to the empty walls of concrete bunkers—the audio equivalent of practicing their technique in front of a mirror. To be successful, the male peacock must not be merely glorious; he must be more glorious than all of his peers. In her latest unpublished work, Yorzinski used cutting-edge eye-tracking technology to follow male peacocks’ gazes. She found that they spend a whopping 30 percent of their time assessing the other males in their lek in an effort to judge the competition. This might sound like a waste of time, but according to Yorzinski, it isn’t. “The males can get into some pretty costly fights with each other,” she says. For love, it seems, is like the peacock’s tail: blind, yet full of eyes. *Correction, Aug. 19, 2015: This article originally misattributed a peacock mating statistic to Angela Freeman. The research was by Roslyn Dakin.